The annual LFA Bar and Dinner will be held on Friday, December 16th. Please mark your calendar and plan to join us! Purchase your Dinner tickets at Reception, 2nd floor B building B235. For more information, contact Amy at 604- 323-5343 or akwan@langara.bc.ca. Please note this even has been cancelled due to unforseen circumstances. VCCFA is hoping to reschedule Dr Bernard to speak in the spring. to stand up for post-secondary education! The LFA invites faculty and staff to submit ideas for ads that will be displayed on buses and in Skytrain stations in the run-up to the provincial election in May. The aim is to educate the public about the crisis in under-funding of post-secondary education and to motivate people to vote in the BC election for candidates who pledge to give more money to colleges and universities. 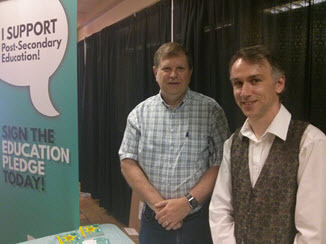 FPSE president George Davision (left) joins history instructor Niall Christie at Langara College on September 9th to help distribute pledge cards to students and faculty in aid of the Open the Doors campaign in support of public post-secondary education in BC. Some 530 cards were signed in two days. Do you support keeping colleges and universities affordable? Find out more and take the education pledge at http://www.openthedoors.ca/.